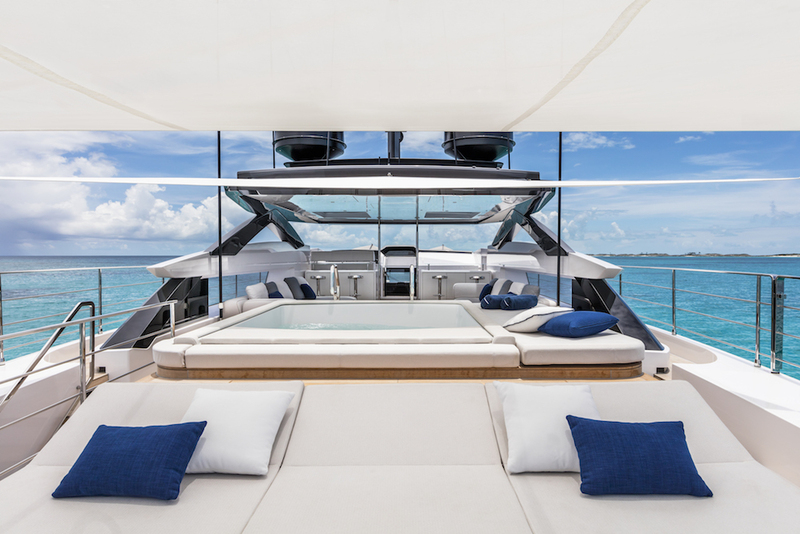 The 120 is the first Custom Line yacht to bear the signature of Francesco Paszkowski Design. 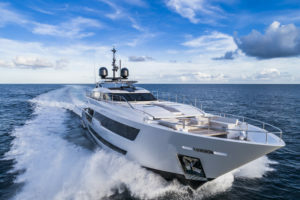 An array of new key features were included, starting with the design of the hull, with its bottom lines characterized by the extension of the quickwork towards the bow. 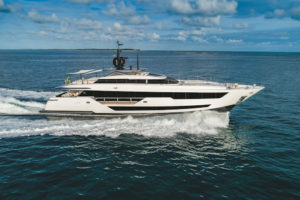 This choice is the result of careful analyses aimed at reducing resistance to guarantee exceptional performance and consumption, all considering the volumes and the displacement of the vessel. 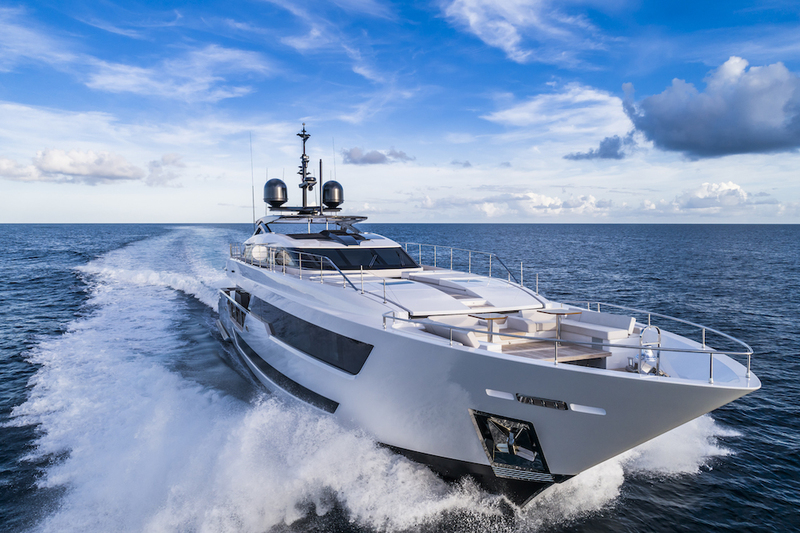 The hull design is inspired by technologies used for racing power yachts, with particular attention and care given to the production of the structures to ensure the maximum strength and lightness. 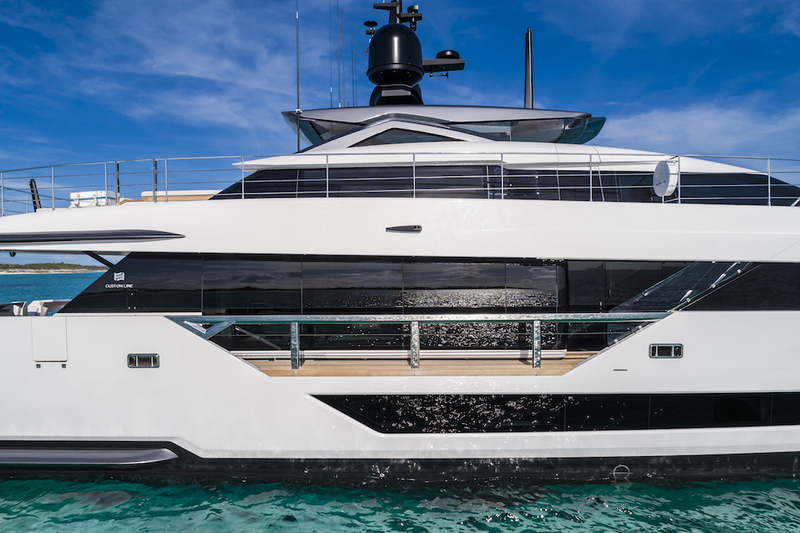 In addition, expert use of carbonin the superstructure made it possible to achieve an elegant design of the part of the flybridge that extends toward the bow without the need for supporting props in the cockpit. 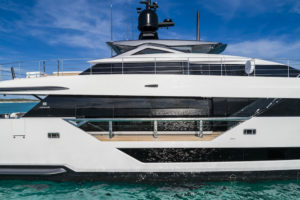 Exterior design The profile is sleek and powerful: taut lines run from stern to bow, creating a spectacular alternation of materials and colours in the light structural surfaces and dark tinted windows. 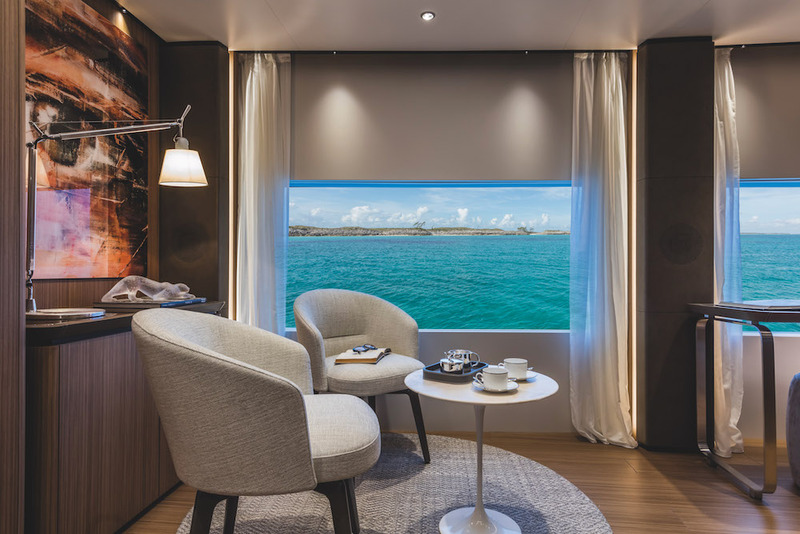 The hull windows are large and generous, and floor-to-ceiling windows on the main deck offer direct contact with the sea, thanks to pulpits that take the place of the traditional gunwales. 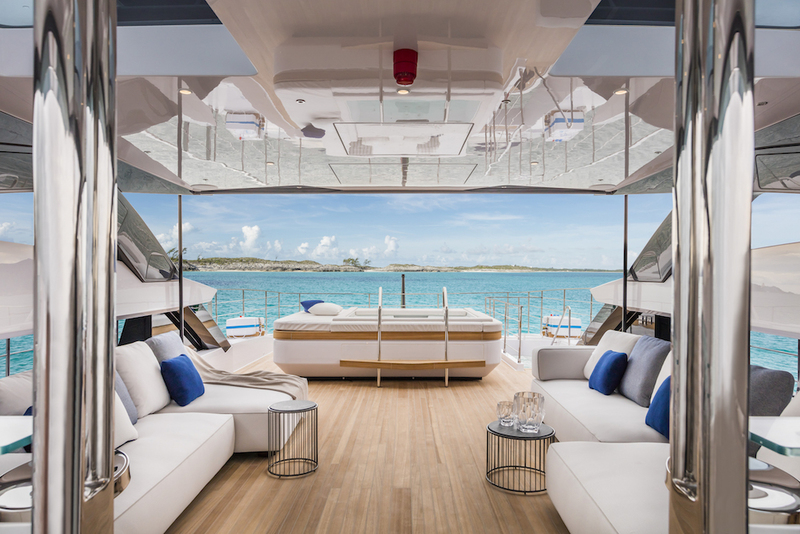 The side windows on the flybridge make it possible to have a well-sheltered panoramic sun deck. 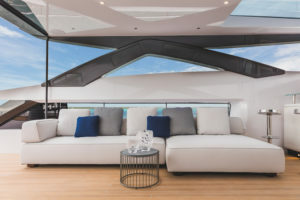 The cockpitfeatures an innovative glass door that gives access to the lounge. It is inclined at a 45° angle and, in addition to the usual slide opening of the two glass panels, it has a tilting mechanism so that it can be raised completely up to insert into the ceiling. 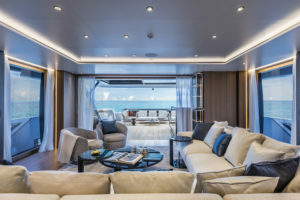 Developed in conjunction with Mecaer Aviation Group, a company that works in the aeronautical industry, the door makes it possible to join the cockpit area to the lounge to create a single environment of more than 80 sq m (861 sq ft). 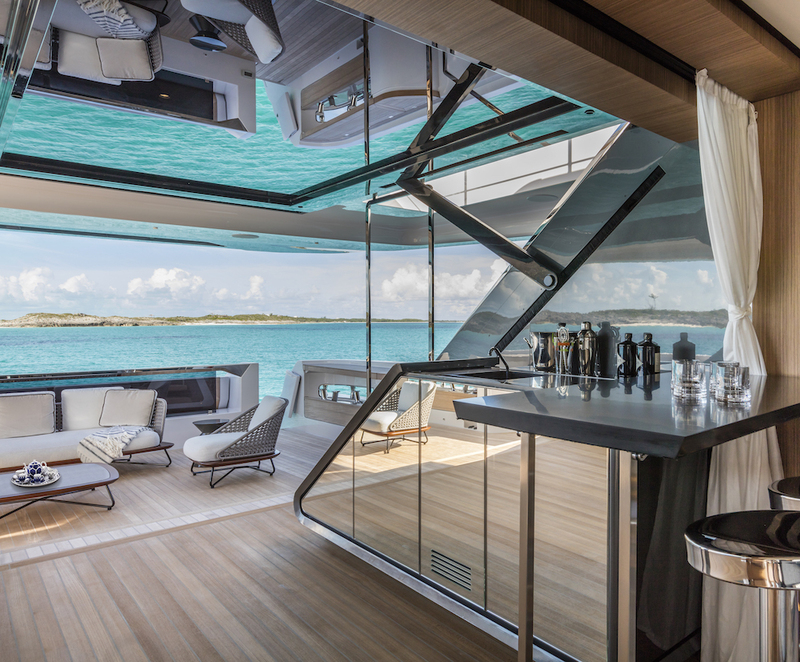 Another outstanding innovation is the elevation of the lounge floor, which uses a floating floor to provide an unparalleled view of the sea. – the large central lounge, fitted with wide, tall side windows that create an effect of greater continuity with the sea. 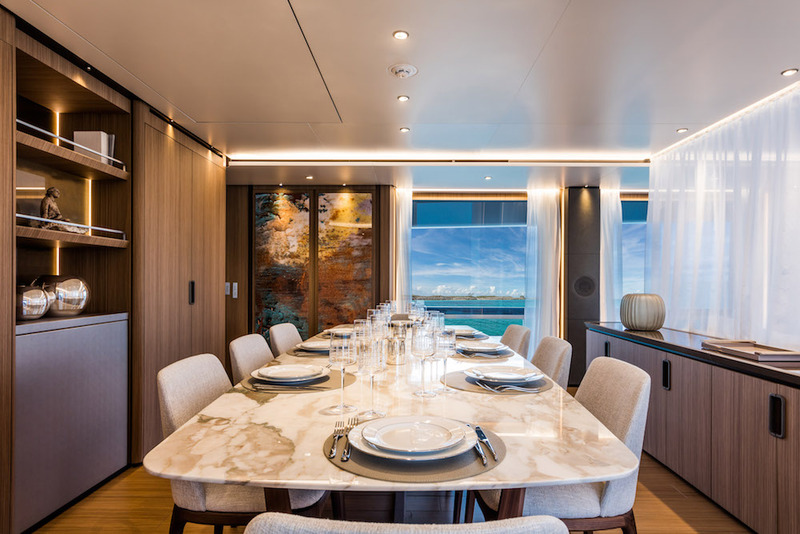 Beyond the formal dining zone, the lobby gives access onto the walkway through a large glass door, as well as belowdecks and to the master suite. 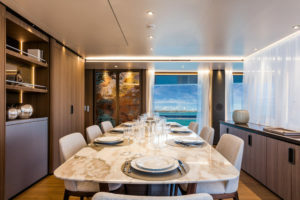 From the opposite wall, there is access to the pantry – also reachable from the outside – and then the galley, from which the crew quarters below can be reached. 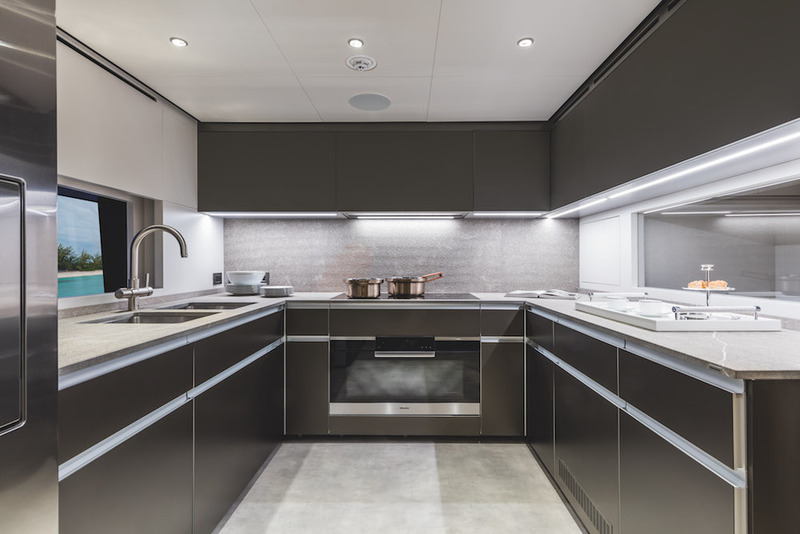 The pantry also gives access to the navigation bridge. 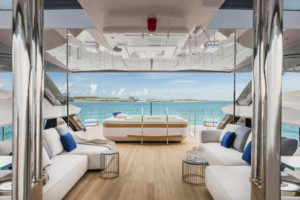 Here, the captain can use the LOOP integrated bridge system created in conjunction with Naviop-Simrad, which has touchscreens installed seamlessly into the dashboard, creating a single direct interface with the ship functions and enabling total control. 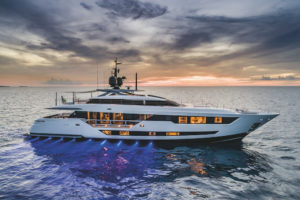 The wide body owner’s suite of over 35 sq m is outfitted with a separate dressing room and full beam bathroom with dual facilities, vanity, and a central shower. On request, the owner can also have a panoramic terrace installed. 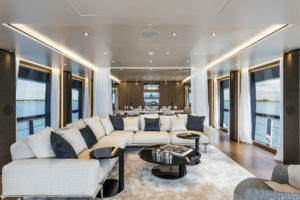 There are 4 guest cabins on the lower deck. The 2 VIP cabins astern feature a special arrangement of the beds, which face the bulwark to make the most of the view from the large hull windows. 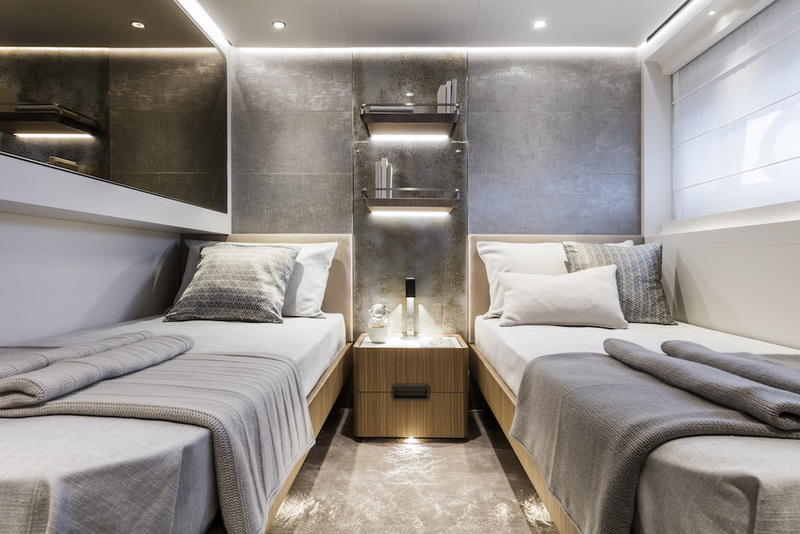 The two forward cabins have single beds, to which a pullman bed can be added. 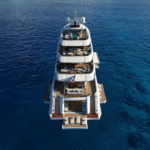 All the cabins have an en-suite bathroom with separate shower. The crew quarters forward include a large dinette, captain’s cabin with desk and private bathroom, a hostess cabin, and two double cabins for the sailors, all with private bathroom and separate shower. The comfort of a flybridge and the sportiness of a coupé also blend wonderfully on the sun deck that features a relaxation area with whirlpool tub and free-standing furniture, and can be protected from the sun thanks to a retractable bimini top in the hard top equipped with a skylight. 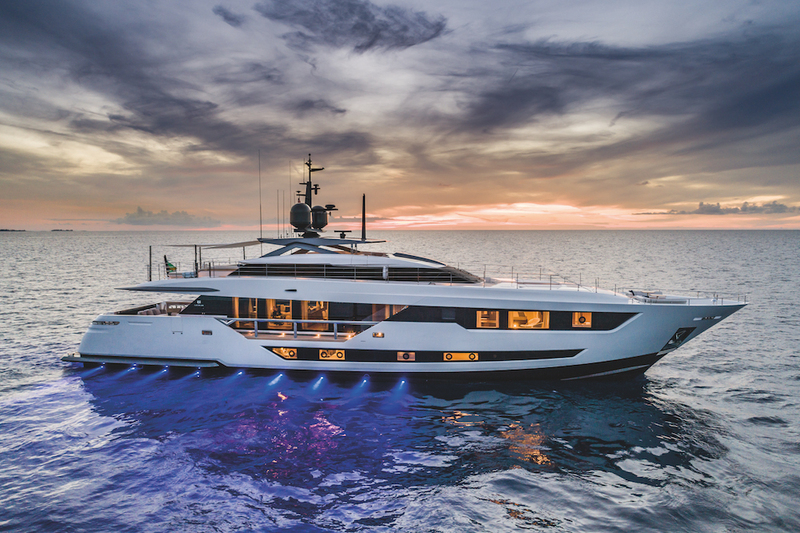 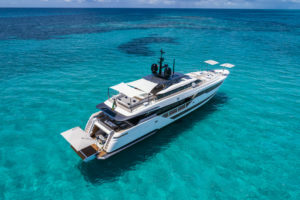 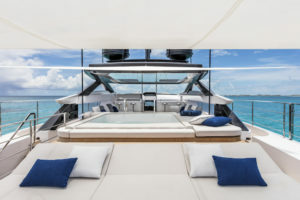 An innovative concept enables a direct connection from the flybridge to the forward zone by means of lateral corridors with additional access from the monkey bridge. 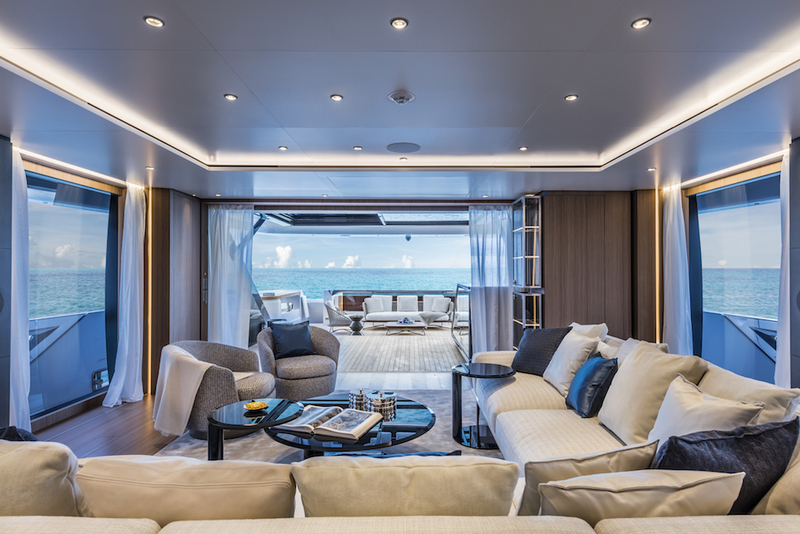 This feature makes it possible to have a single large deck of 100 sq m. Two sun pads at the sides of the walkway lead to the foredeck, furnished with a large dinette. 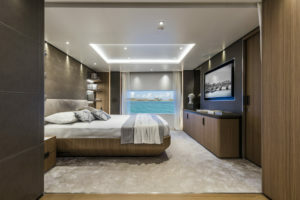 At the stern, the patented DMT – Dual Mode Transom system is implemented with the installation of two hatches that conceal the stairs to the cockpit when the ship is cruising, providing an exceptionally clean aesthetic. When the ship is stopped, the stairs pass through the garage door, allowing guests to climb aboard. 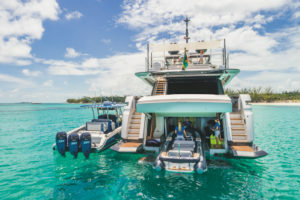 From the garage, a tender of up to 5.65 meters and a three-person jet ski can be lowered into the water. Consistent with the Custom Line tradition, there is another garage forward, which can be used to store a 3.25 m tender or a jet ski. 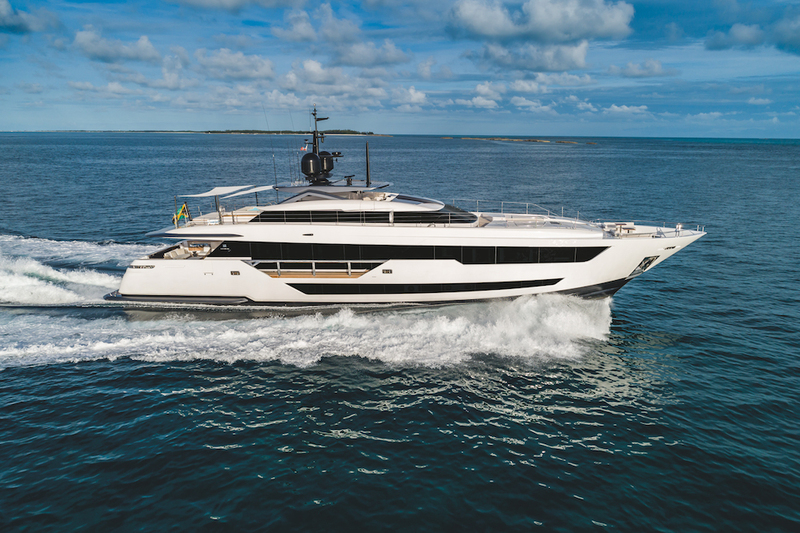 Custom Line 120’ installs a pair of MTU 16V 2000 M96L engines that generate 2,638 Mhp, allowing a cruising speed of 21 knots and top speed of 25 knots (preliminary data). 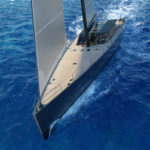 An interesting option is the economical cruising speed of 11 knots, with a range of up to 1100 nautical miles(preliminary data). 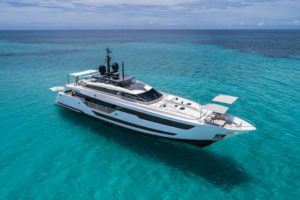 Comfort is also guaranteed when the ship is at anchor, thanks to the standard installation di electro-hydraulic stabilizing fins, offering both underway and zero speed modes. The utmost attention has also been given to acoustic comfort in order to reduce the impact of engines and generators during navigation and at roadstead: Custom Line 120’ features a floating floor and supplementary thermal insulation between the bulkheads and in the ceilings.